Shares finished higher Monday, the last day of the year, but most big gaming companies ended 2018 down more than 30 percent, their worst annual performance since the Great Recession a decade ago. Investors who rolled the dice on casino stocks in 2018 came up with snake eyes. While shares finished higher Monday, the last day of the year, most big gaming companies ended 2018 down more than 30 percent, their worst annual performance since the Great Recession a decade ago. The Dow Jones U.S. Gambling Index, which consists of the top Las Vegas gambling stocks, tumbled 33 percent in 2018. That compares with a 5.6 percent drop for the Dow Jones Industrial Average Index. Eldorado Resorts bucked the trend, rising 9 percent in 2018. Nothing initially foreshadowed the punishing declines. Gaming stocks got off to a blistering start in 2018 after Congress passed and President Donald Trump signed into law corporate and personal income tax cuts. The tax cut generated massive one-off gains for Las Vegas casino operators, including nearly $340 million for Wynn Resorts Ltd. and $526 million for Las Vegas Sands Corp. It also raised hopes U.S. economic growth would accelerate, leaving companies and individuals with more cash to spend at conventions and casinos in Las Vegas. Wynn Resorts stock jumped 19 percent over the first three weeks of 2018, and MGM Resorts International climbed 10 percent. They would soon give up those gains — and then some. After months of fruitless trade talks, Trump imposed tariffs on $34 billion of Chinese goods in July. The spat intensified as China retaliated and the United States responded with additional tariffs. That may have spooked high rollers in Macau, the Chinese gaming enclave, who are dependent on U.S. trade, analysts said. “The top 10 China provinces by visitors to Macau had combined about $294 billion of exports to the U.S. in 2017, so we believe the trade war could hurt consumer and business confidence of players coming from key source markets in China,” UBS analysts Robin Farley and Arpine Kocharyan said in a Dec. 5 note. That seemed to have been the case. Macau gross gaming revenue growth fell from 22 percent over the first four months of 2018 to 9 percent over the next seven months. Shares of Wynn Resorts and Las Vegas Sands — companies that generate more than half of their earnings from Macau — fell as the trade war escalated. Wynn finished the year down 41 percent, and Sands was down 22 percent. MGM Resorts, too, was impacted by the cooling growth in Macau. However, problems closer to home sent MGM shares tumbling to a more than two-year low. The Trump tax cuts fired up the economy. Economic growth surged 4.2 percent in the second quarter — the best result in nearly four years — and 3.4 percent in the third quarter. However, it did not lead to a boom on the Strip. Caesars Entertainment Corp. announced Aug. 1 that Strip third-quarter earnings would be weaker than initially anticipated. The company’s downbeat forecast took investors by surprise. MGM made a similar announcement the next day. 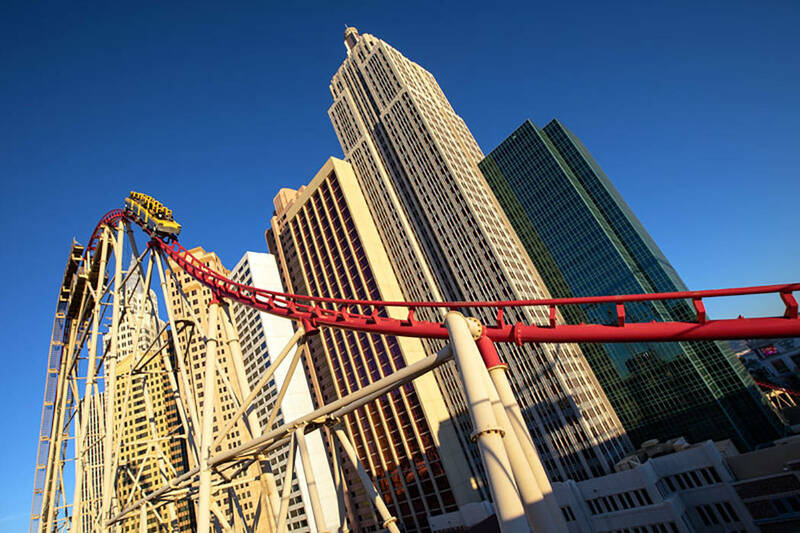 “It was not a positive outlook for the summer in Las Vegas, as the business levels certainly did not heat up with the temperatures,” Telsey Advisory Group analyst Brian McGill said in a note to clients Aug. 3. Both companies later reported a decline in Strip revenues for the third quarter, but investors did not wait for the official announcement to dump shares. Caesars tumbled as much as 25 percent on Aug. 1, while MGM dropped as much as 9.7 percent that same day. Company executives blamed the revenue decline on fewer Strip events compared with the summer of 2017. They dismissed it as a blip and promised the fourth quarter would be stronger. However, the idea of falling revenue amid a period of strong economic growth began to make some analysts fear a possibly larger issue at hand. Strip operators, including MGM Resorts and Caesars Entertainment, had been hiking fees for years while also tightening gaming odds. There was concern those costs were chipping away at the image of Las Vegas as an affordable destination. Casino executives rejected that notion, but they didn’t have a chance to prove their fourth-quarter optimism before the next trigger to sell gaming shares emerged. The Trump tax cuts that helped fire up the economy also drove the Federal Reserve to hike rates four times in 2018, sparking fears that the increases would tip the economy into a recession. Shares in the most highly leveraged companies — including Scientific Games and Caesars — tumbled amid recession fears. Scientific Games’ net debt is 6.5 times its 2018 cash flow, while Caesars’ is 5.6 times. Shares of the Las Vegas slot and lottery company fell 65 percent in 2018, while shares in Caesars dropped 46 percent. Investors may have better luck wagering on gaming stocks in 2019, said Cameron McKnight, a gaming analyst at Credit Suisse. He highlighted in his Dec. 20 note that Las Vegas convention attendance during the first half of the year is tracking 11 percent higher while the number of events will remain stable. “We are positive on domestic gaming in 2019, given underperformance, a good consumer backdrop, and pockets of defensive exposure if a recession is more likely,” McKnight said.